In a survey conducted by the University of North Carolina at Charlotte, 422 men and women incarcerated for burglary were polled about their habits and motives. Two of the primary factors were ease of entry and the proximity of other people. If a door or window was left unlocked and the burglar didn’t have to force their way in, that home was more likely to be a target. So, the first step to protecting your home should be ensuring all your door and window locks work and they are all locked when you aren’t home. In addition, it’s important to ensure your locks are all installed properly, as a poorly installed or loose lock is easier to force open. You’ll want to check that all doors and windows close firmly and your locks close fully. In particular, check that the deadbolt plates on outward facing doors are all installed with at least 3-inch long screws. Any shorter, and your deadbolt will be easy enough for a thief to force. According to the survey linked above, a whopping 83 percent of those polled said they would check for the presence of an alarm before attempting entry. Of that number, 60 percent said they would search out a different target if there was a security system present—which doesn’t even account for homes in which there are components of a security system, but they aren’t monitored. The important factor to the thief was the presence alone. So, one of the most straightforward ways to protect your home is to invest in door and window sensors and/or video cameras. There are home security system options that can be monitored for you by a security company, or sensor options that connect to your home’s wi-fi and send you text or email notices when someone enters. Whatever you choose, don’t bother trying to hide the components. Place them where they’ll be useful, but also easily visible. Another primary deterrent, according to the burglars surveyed, was the presence of someone in the home. Or the appearance of someone inside. If you are planning to leave on vacation or even just leave your home regularly for extended periods of time (like work), creating the illusion of a presence in your home can help deter theft attempts. Start by adding light sensors to turn lights on once the sun sets—at the very least, an illuminated home deters thieves because they will be easily visible to anyone outside. 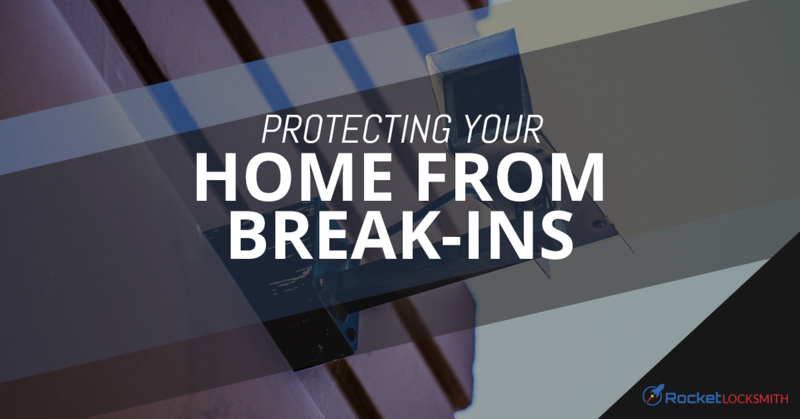 Smart home technology like app-controlled lights, TV, or a sound system can also be valuable tools to trick thieves into thinking someone is home. For re-keying, getting keys made, and other ways to secure your home, contact your local St. Louis locksmith team at Rocket Locksmith today!